The Anglo-Saxon church, Lady St Mary, Wareham, Dorset. The ancient minster church of St. Mary stands at the southern edge of the Saxon burgh and town, and within 60 yards or so of the River Frome. Grid reference SY925872. Asser, the biographer of Alfred The Great, says that there was, within the walls of Wareham, "a Monasterium of Holy Virgins," but does not state who was the founder of that house, nor the date of its foundation. This must have been the Nunnery of the Benedictine Order, originally founded by St. Aldhelm about the year seven hundred, or more probably it was an earlier foundation and was reformed by Aldhelm. The Danes did much damage in 876, and was rebuilt by Elfleda, daughter of King Alfred, only to be burnt by Canute in 1015. These buildings must not be confused with St. Marys church which was no doubt coeval with the nunnery and did not share its fate at the hands of Canute. After the Conquest (but before 1086) the minster church had been given, along with its possessions, to the abbey of Fontenelle in Normandy. Fontenelle was also known as the abbey of Saint Wandrille. Later, in 1150, it was given by Robert, Earl of Leicester to the Abbey of Lire (Lyra) in Normandy which established a Benedictine Priory, thereby replacing the canons. During the ensuing millennia the Saxon work was reduced and replaced until only the aisled nave remained. In 1841-2 demolition of the nave was instigated by Richard Fayle, the Rector, who decided the it was 'inconvenient' and who wished to fit the then fashionable type of gallery fixed to the pillars rather as in a theatre, and so they pulled down the old nave. This destruction also involved the shortening of the chancel by 8 feet. The Rector was quickly replaced, but regrettably too late to save the nave. Top left, a fine illustration of the north aspect of the church (click the image to enlarge) by the Reverend John Hutchins, and seen before the destruction of the nave but published after his death. The Rev'd J. Hutchins (1698-1773) spent decades writing his "History" which was published by his son-in-law, John Bellasis, in 1774. Right, from old paintings, two views of the church; topmost, the exterior from the NW, and below the nave interior looking eastwards. There has been much debate upon the date of the nave of St. Mary’s (bearing in mind that there are now no remains whatsoever of the Saxon building). Taylor (cautiously) gives a date as, “possibly period C” – that is to say 950-1100. He states (i), “ . . of the deplorable history of the demolition in 1841-2 of what was almost certainly an unusually interesting pre-conquest nave.” He further states - The plan (by T.L.Donaldson, architect) shows a nave 64 feet long by 25 feet 3 in. wide, with aisles 8 ft 6 in. wide; the outer walls were 2 ft 6 in. thick, and the main walls about 2 ft 9 in. Hutchins described the arcades as being of 6 arches, with 5 piers between; Donaldson's plan confirms this, except that it shows a seventh arch cut through on the south at a point where on the north there remained solid walling. The plan shows the piers of the arcades as of a plain rectangular section; and the interior painting preserved in the church shows plain round-headed arches of a single square order, as at Wing in Bucks. The plan shows the arches 5 ft 4 in. in span, separated by piers 4 ft 4 in. in width. Antiquarius, who described the church in a letter dated 3 September 1840, said the piers were thirteen and a half feet high to the springing; and thus if the arches were semi-circular, they would have been sixteen and a half feet high to the crown. Taylor goes on to say - The old painting clearly shows the head of the chancel-arch outlined by a semi-circular hood-mould, apparently of plain square section (see the lower painting, right). Sir Stephen Glynne, Bart., of Harwarden, who visited the church in 1825 described it as follows: "The Nave is broad and handsome and is divided from the Aisle by several semi-circular arches of uncommonly narrow proportions with plain square piers. The whole is cased over and has a very recent appearance, but, it appears, is original Norman work. The Clerestory windows are plain Norman with sloped sides. The Clerestory is very high, but the upper portion is embattled and does not seem original, but the external appearance of it is unpleasing from the smallness of the windows and quantity of bare wall. The Aisles are particularly narrow and low. The North Aisle has small windows of Early Decorated character, as also has the South Aisle, giving but little light. The Chancel is divided from the Nave by a semi-circular arch, but (the chancel) is of Decorated work and contains windows of very fine tracery." Again, referring to Donaldson's plan (scroll down for link) one may see that the side aisles show signs of having been divided up (into 'cells' or chapels, each with an altar). In much the same way Deerhurst Lady St. Mary was similarly treated, and at that church there remains the stubs of Early English arches where the then re-builders had broken through the walling to open up the side chapels thus making a continuous aisle. We may therefore be reasonably certain that originally each archway of the north and south arcade at Wareham gave access to its own side chapel, that being perfectly normal for the first half of the 9th century. 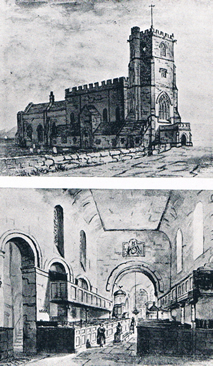 A painting (right) by Frank Parsons, dated to about 1967, of the old Saxon nave and which was taken from (and adapted from) an original (which see above right), painted prior to the demolition and reproduced in a guide to the church written by Lionel Howe (Rector 1936-47). 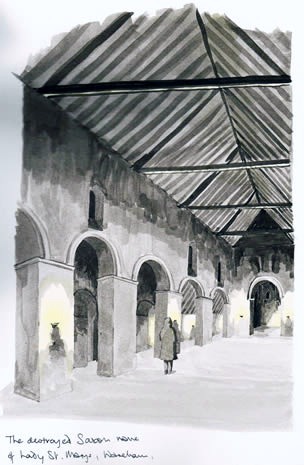 The 'new' painting looks eastward to the chancel arch and with the north arcade on the left hand. Above the chancel arch is a Saxon rood (this however is purely artistic licence, although a distinct probability). It was painted trying to convey the atmosphere and view one might expect in a lamp lit Anglo-Saxon minster built some four hundred years after the departure of the Roman legions. I have given it a tentative date of construction of 820 to 880, and which is perfectly possible since the scale of the undertaking and the style of fabric are normal for those dates. The thumbnail pencil sketch (below left) was created at the same time and is an impression of how the Anglo-Saxon nave may have looked when built, viewed from the north-west, and with a west porch not dissimilar to the first at Deerhurst church (albeit smaller) and with the north porticus seen in Hutchins plate. Note the nave aisles 'clasping' the western part of the chancel, this echoes Syrian practice and is also found at (ruined) Reculver minster. Perhaps some parts of the earlier building at Wareham remained despite a later rebuilding? Canon Lionel Howe, and his successor, D.R.Maddock (Rector) state that the Royal Historical Commission put a date of circa 650 on the fabric. The nave at St. Mary survived the Gothic period with few alterations, the Georgian period touched it but lightly, and it is to be greatly lamented that the palpable ignorance of one man in early Victorian times was to be its downfall, thus robbing us of a virtually unrestored and fine example of a major aisled Anglo-Saxon minster church. Today it would have been one of the prime aids to our understanding of pre-conquest building achievement, in a similar way as Deerhurst is. There is no doubt that the nave had a north porticus (and undoubtedly on the south also, making reference to Donaldson's plan) with four clerestory windows on the north side and a nave of 6 bays with side aisles which extended *clasping the westernmost part of the chancel. *That part of the church may have been a remnant of an earlier church since it is a Syrian feature (as at Reculver church). Inside the church today may be seen fragments of an Anglo-Saxon cross, and inscribed stones, all from the pre-conquest period. Some of these were found built into the fabric of the original nave. references. (i). H.M.Taylor & Joan Taylor. Anglo-Saxon Architecture. vol 2, pages 634-637. The plan by Donaldson (pdf file) shows the church before and after the destruction of the nave. 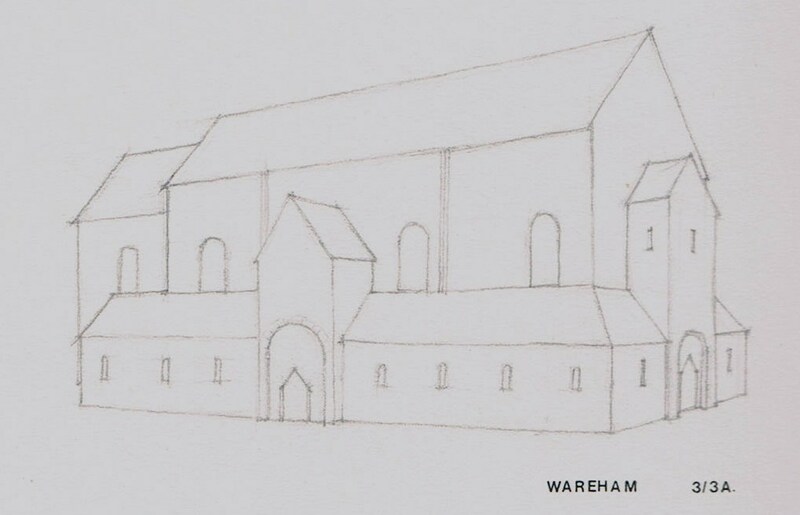 The lower drawing is of the rebuilt church, the topmost drawing is of the Saxon nave and church prior to the demolition. Click here for main menu (including photo pages of individual selected churches). Over 400 Saxon churches listed! - an invaluable listing/database, a downloadable table (unique to this site) which gives information of the known churches in England exhibiting Saxon features and fabric (and with details of those features), a comprehensive listing noted by place name, county, and grid reference; wholly based on H.Taylor's three sterling volumes, "Anglo-Saxon Architecture". Searching for a particular church? See if its featured here.